We're closing in on May, which means we're closing in on the last month of summer! I can't believe how quickly time flew. Before the season ends, let me share with you another way in which you can dress up to keep it casual chic in the office without having to cage your legs in denim jeans. My alternative? Denim skirts - and not the short kind that's totally inappropriate for work! 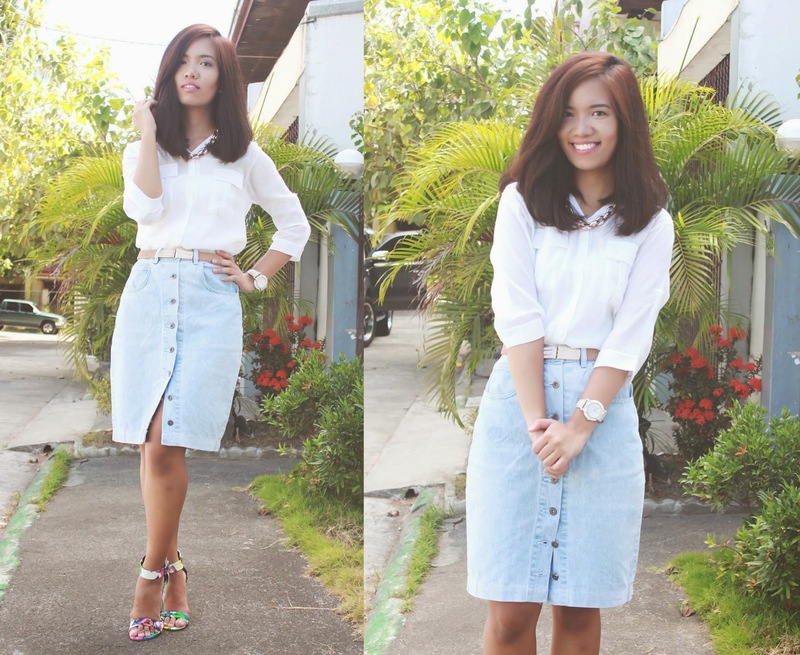 This button-down denim skirt is a hand-me-down from Mom which I absolutely love. You can close it all the way or leave a few buttons undone for an easier time at walking and adding character to your look. Keeping the color palette light and fresh, I stuck with a white button-down and a white fun printed pair of heels to tie it all together. Keeping cool this summer in your office outfit also has a lot to do with the colors you wear, so make sure to bring out the pastels and brights whenever possible. My favorite part about this look is actually the length of the skirt. No need to worry about your skirt running too short or getting peek-a-boos (okay, except maybe when the buttons get undone - but that doesn't really happen).